The Holy Land, at the time of Supply-Side Jesus. Supply-Side Jesus is little-known outside of Republican circles, but his life has been chronicled recently by the biblical prophet Al Franken. It turns out that Supply-Side Jesus was a contemporary of that other Jesus, the Jesus of Nazareth. While this article is not about Jesus of Nazareth, but about the real, true, one and only Christ, the Supply-Side Jesus, we should allow Jesus of Nazareth at least a small footnote in this article. Jesus of Nazareth was, to those of you who don't know all these obscure Biblical references, and we'll just get this one out of the way: According to Edward S. Herman (an early scribe), Jesus of Nazareth was an early rabble-rouser of Communistic tendency, and the victim of an early witchhunt. It could even be asserted that he would be one of the first witches to ever be hunted. Jesus of Nazareth is often confused with Elvis Presley. While "Jesus's countenance was like lightning and his clothing white as snow" (Matt 28:3), Elvis had been seen on stage wearing snow-white jumpsuits with lightning bolts. And the two were never seen in the same place at the same time, which makes the similarity even more creepy. 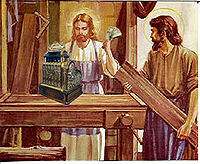 Supply-Side Jesus selling wood to an unknown carpenter. Both Jesii have had some connection to wood and nails. Supply-Side Jesus ran a hardware store that sold dry goods to local contractors and home renovators. Jesus of Nazareth was at that time not widely-known and frequented the establishment due to their unbeatably low prices and courteous service, while oblivious to the fact that much of the tools and dry goods he was buying were made in Byzantine sweatshops using child labour; and that those who worked under Supply-Side Jesus signed an agreement not to ever join a union. Supply-Side Jesus established himself as the kind of salesman who was able to sell sand to Bedouins. Indeed, once he succeeded, a typical Bedouin he might have sold it to would curse himself the next day for his stupidity. Said bedouin could not return his sand for a refund, since he would never be able to prove that the sand he purcahsed was any different from the sand in the surrounding desert. What was he thinking? Supply-Side Jesus also sold clay and limestone to build houses that were not much different from the clay and limestone which littered the landscape in those days. Jesus of Nazareth would also buy twigs and branches to make the walls and thatched roofs of the houses in his contractual territory, which covered a sprawling Jerusalem suburb known as Bethlehem. Supply-Side Jesus's main distributor of loaves, fishes, carpentry supplies, frankincense, myrrh, and tabloid magazines to the Holy Land. Business was booming in Bethlehem, what with new families coming in on their Sport-Utility camels looking for a place they can call home away from the Jerusalem rat race. Many more would come from far and wide every few years for the Census. The influx of new families pushed up the demand for mangers and swaddling clothes, so Supply-Side Jesus had to diversify from hardware and dry goods and create the first Jesus Christ Superstore. Not only would he sell hardware and building supplies, but he would also sell food, incense, and tabloid magazines. Frankincense and myrrh sold like hotcakes, as did hotcakes, since they were a bread product which seemed to go well with their other food product, fish. There were, however, local complaints that Jesus Christ Superstore was taking business away from the local apothecaries, fishmongers and bakers, causing them to close and have to work at Jesus Christ Superstore as a greeter or as a stock boy at a fraction of the wages. According to the Gospel of Franken, the ideals lean toward those whose fruits fall from the God of Mammon, also known as The Free Enterprise System. The poor can never be helped, since that would make them lazy. The sick can never be healed, since being sick is a matter of personal responsibility. If word got around that Supply-side Jesus healed the sick, then everyone would get sick on purpose, and there would be no incentive to staying healthy. In addition, healing the sick would eventually result in a healthy population, and that would put privatized health care providers out of business. Similarly, if everyone knew that loaves and fishes were being handed out free of charge, everyone would get poor on purpose, including kings, queens, merchants, smiths, and all other workers. There would be no incentive to work for a better life. Supply-Side Jesus became a distributor of bread and seafood to his consumer base, restricting its distribution to keep the price high, causing poor, lazy people to go hungry as their penance for being poor and lazy. Supply-side Jesus at an earlier time in His life, little-mentioned in the Bible. Here, Supply-Side Jesus takes a selfie and posts it to the first social media site to ever exist, called The Wailing Wall. There is nearly 20 years of His life not covered in the Bible. Recent evidence uncovered a "selfie" made about 2000 years before selfies were even thought possible. The selfie was found inserted in Jerusalem's Wailing Wall, the world's first social media site. It suggests that Supply-Side Jesus was a "toughie" as an adolescent. He would hang out in bars, party till all hours, and wink at the prostitutes. He was later seen hanging out with a wealthy gang, sporting rifles and harassing the poor for being lazy bums. The wealthy kids let Him hang out with him because though He was poor, He was a talented salesman, well-connected, and knew who His father was, unlike the gang He hung out with. A direct quote from Jesus, translated from Latin: "Whether you want loaves of bread or fish, I am going to give you a drug test and shame you for being a welfare bum, you loser!" Supply-side Jesus, in fact began to lead the gang of 12 wealthy teens, and along the way, also began to amass wealth from running Jesus Christ Superstore chains throughout The Holy Land and beyond. His main competition came from the Pharisees and the Saducees, who both complained to Trade Comissioner Pontius Pilate that He was cutting into their action. Supply-Side Jesus and His Gang of 12 would start large blacksmith operations that would produce swords and armour for the Roman armies and sell them to the Roman government at hundreds of times the cost of producing them. This was the start of what became known as the Military-Tradesmen Complex. It was promoted as a humanitarian effort on the part of the Gang to start an arms race with Persia, leading to a cold war between the two empires and eventually break the Persian Empire. This, along with news of an imminent attack by Persia kept Roman taxpayers in support of the arms race. Behind the scenes however, they sold arms to both sides, then sided with the Arabs when they took over the East Roman Empire (Byzantium). The arms race caused taxes to skyrocket and the poor to become poorer. At least the decline and fall of the Roman Empire was begun in the name of Free Trade and Open Markets. Businessmen should have the right to sell anything they want to anyone with the money to pay. Supply-Side Jesus may never have been crucified, but His spirit lives among us to this day. This page was last edited on 9 June 2015, at 02:46.